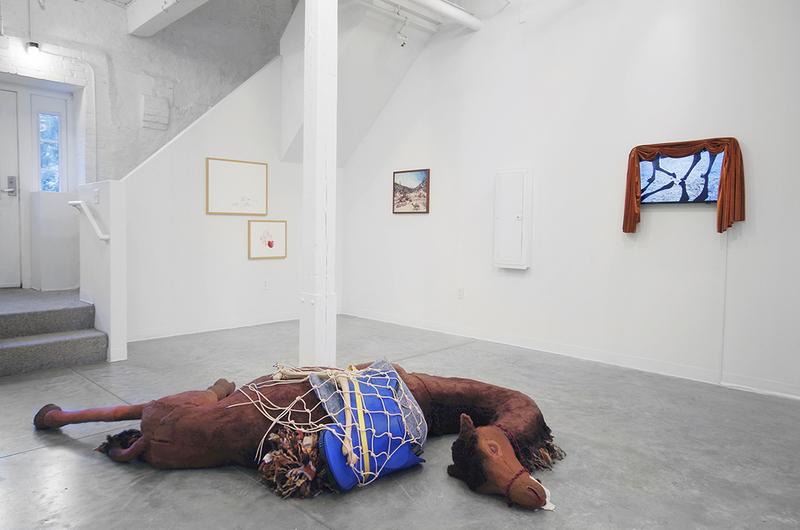 An interdisciplinary, collaborative exhibition, Fantasia Colorado takes inspiration from an event that sounds too improbable to be true; it includes a double murder mystery, a ghost, and a rouge camel that terrorized the post-Civil War American West for almost a decade. Fantasia Colorado blurs fact and fiction by examining the boundaries where myths are born. Raina Belleau and Caleb Churchill question how we remember events through the examination of the aftermath and the founding of the Camel Corps, an effort by Jefferson Davis in 1855 to employ camels in the United States Army. The story spun fantastical fictions across the region, but no rumor is more dazzling than the truth. 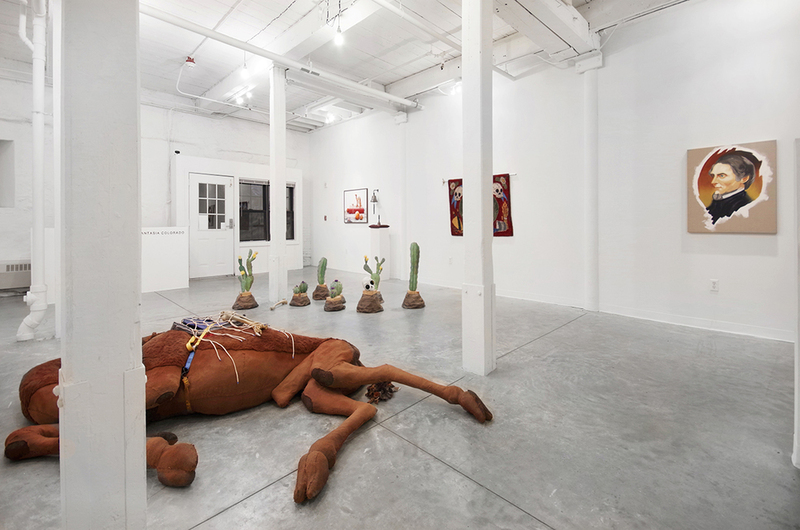 This collaborative installation forces the viewer to question their acceptance of both the facts and fictions surrounding historical factual folklore. Entering the gallery, the viewer will be presented with an over-sized camel sculpture alongside busts of the Camel Corps' founding fathers, a handmade rug, digital media and historical “memorabilia”. From the founding of the Camel Corp, to the ghostly camel’s humble death in the farmer’s garden, each work adds new details to the exhibition’s overarching narrative. 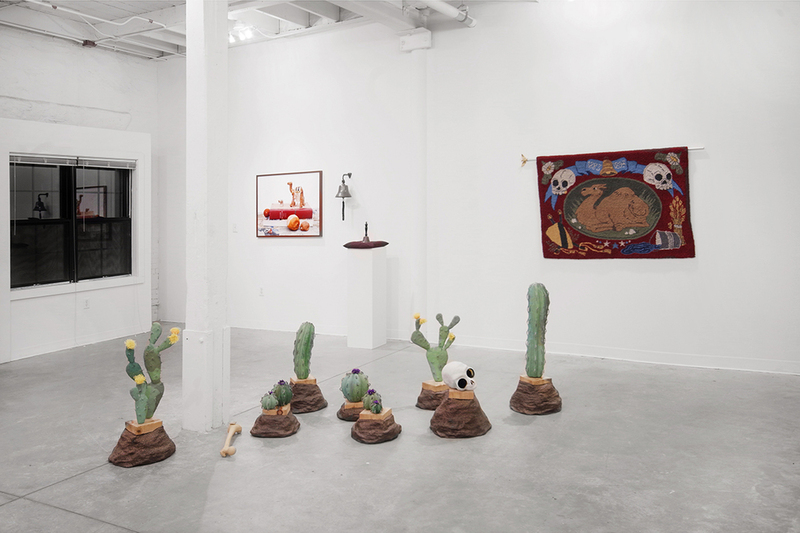 The story of Fantasia Colorado is tragic and humorous, and this project aims to perpetuate the myth, clarify the history and to point to the moments when it is most difficult to untangle the two. The works themselves do not simply illustrate the story, but also add elements of complication. History is often retold in ways that favor the narrator, just as every ghost story needs a monster. In researching the legend and the history, the artists have uncovered multiple versions of each. Presenting the story without bias, Belleau and Churchill ask the viewer to decipher the truth for themselves. My work has been influenced by wildlife and a cultural relationship to nature. I engage linear and non-linear narrative, often using animal forms to create characters and symbols. Inspired by cinema, natural history and environmental issues, I create surreal scenes with an underlying dark sense of humor. These scenes are at times ideals and at others, dystopias. They convey my personal desires and anxieties surrounding the environment and it’s inhabitants. Through my sculptural work I explore nature’s influence on culture with an empathetic yet critical eye. My precise and detailed sculptures are constructed from a wide variety of materials and techniques. I frequently use manmade materials to mimic those found in nature such as zip ties for porcupine quills or window blinds for feathers. This use of material speaks to our relationship with the natural world and draws attention to where and how the boundaries between the built, urban world and nature collide. I build quickly and freely, drawing in references through my characters and materials. I am drawn to small moments of realism where a detail of a large piece is hand rendered and painted to draw in the viewers’ attention. These moments create resting places in sometimes chaotic scenes. 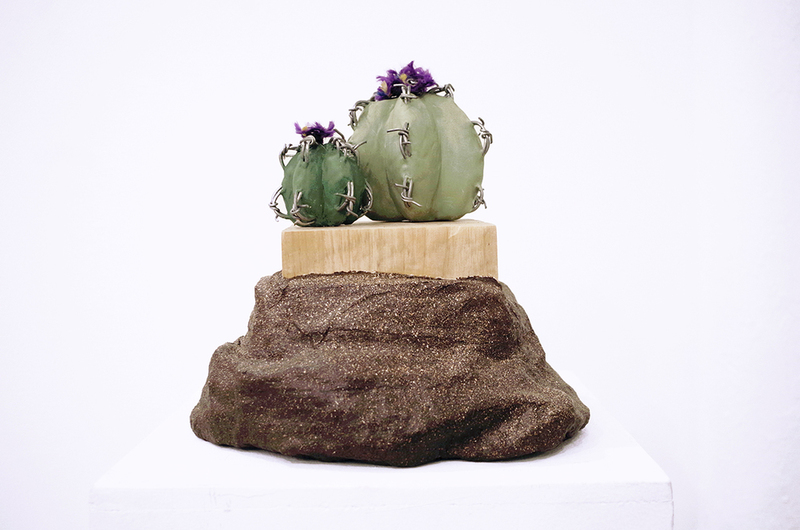 The sculptures become their own ecologies in which we can explore our place in the larger environment. My work seeks to expand the way we see the world around us. Whether this is taking notice of subtle moments of beauty and humor in the seemingly mundane or questioning ideas we have taken for granted as fact. A background in photography has informed my way of looking at the world and of how we view art, both images and objects. In expanding my practice beyond just photography and into one that is multidisciplinary, I am able to explore, play with and manipulate my concepts and the overall experience of the work. Overarching concept and medium, is a sense of both humor and earnest curiosity. I draw upon my interests in science, conspiracy, literature and art history to act as starting points for bodies of work to evolve. The works, both photographic and otherwise, take inspiration from poetry, always conscious of a sense of rhythm and over all cohesive fluidity. I ask that we step back at ask ourselves exactly how and why we see, both art and the everyday, and the rules that we have set up to do so.